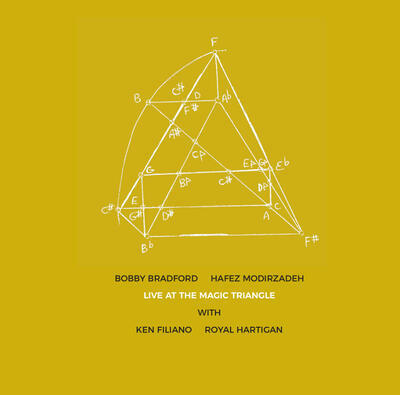 This album presents Bradford with a more recent partner, alto saxophonist Hafez Modirzadeh, in an Amherst, Massachusetts concert, joined by bassist Ken Filiano and drummer Royal Hartigan (the only member without West Coast bona fides) for a program of five originals, including the cornet player’s classic line “She”. This is Bradford’s fourth release on the frighteningly prolific NoBusiness label out of Lithuania and his second with Modirzadeh. “She” is rendered as a dirge, cup-muted brassy barbs apposite the crisp drone of bass and viscous purrs, the theme emerging as a gasping lilt across a field of cymbal taps and rich clamber, cornet and tenor in a braying dance of chortling extrapolations with Modirzadeh reminiscent of John Tchicai in his oblique, repeating commentary. Filiano’s limber pizzicato and incisive, full arco are a linchpin for the proceedings, providing a flexible harmonic ground for crackling silver and gravelly shouts as Hartigan adds a sensitive tumble balanced between background and mid-level surge. A tap dancer and skilled in the use of his hands, Hartigan unfurls a stripped-down and economical web of beats at the beginning of “Wadsworth Falls”, a gallop that beautifully suits Bradford’s laconic, brushy expressionism. Bobby Bradford, turning 84 this month, is a link to the development of this music, seasoning the ‘now’ with the wry swagger of tradition.